A forum for all things cancer related. Brought to you by the Bio 179 students at Santa Clara University. Every time you expose your skin to sunlight, UV rays penetrate your skin. The more exposure, the higher the risk for the UV light to cause mutations. Have you ever wondered why this happens? How does UV light cause mutations? There are a lot of factors that contribute to the risk for skin cancer. In my previous blog I talked about indoor tanning, which is a voluntary exposure to UV rays but in this blog I want to talk about involuntary exposure. I also discuss how location/migration affect your risk. So how exactly does UV light cause cancer? UV light damages cellular DNA by initiating a reaction between two molecules of thymine to form a dimer. As more dimers are formed, the risk for an incorrect repair in the DNA increases (2). This leads to its inability to function normally and it may become cancerous. When the cells are damaged by UV rays, the G1 phase is prolonged and it takes longer for the damaged DNA to be repaired (3). This is because there is a restriction point in this stage to make sure the DNA is intact before moving to the S phase. Like we talked about in class, the p53 protein promotes DNA repair proteins and initiated apoptosis if it the damage cannot be fixed. When p53 is mutated, its ability to carry out its functions decreases and the dimers are not fixed and the cell replicates with the overlooked mutation. This is what leads to cancer. 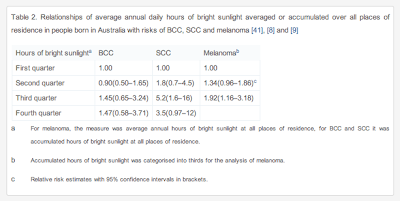 In the article, The epidemiology of UV induced skin cancer, a study was discussed on how length of residency in an area highly exposed to UV radiation affects your risk for the three types of skin cancer: melanoma, squamous cell carcinoma and basal cell carcinoma. The study was done on residents in Australia since there is a hole in their ozone layer and they have high levels of UV radiation. The table below shows the results. The risk is highest for people who were born in Australia and in general, as the age of migration increases, the risk of skin cancer decreases. It decreases steadily for squamous cell carcinoma. Looking at the risk for basal cell carcinoma, it increases from 1.00 at birth to 1.05. Although this is not a significant increase, I wonder why this is. After age 10, the risk rapidly drops to .14 and then goes back up to .22. For melanoma, it decreases rapidly after age 10. The risk for skin cancer is about 3 fold less for those who migrated to Australia after the first 10 years of their life compared to those born there. From this data, the basic message I concluded was that the risk for skin cancer is less for people who migrate to an area with high levels of UV radiation compared to those born there. Another interesting part of this article focused in on was the effect of involuntary exposure and risk for skin cancer. The categories can be seen in the table below. Sunburn was a category most likely because a history of sunburn can be a large indicator for skin cancer. This shows a linkage with melanoma. There is a 91% higher risk for melanoma for people with a history of sunburns. However, this does not mean you are 91% more likely to get melanoma if you have a history of sunburns, it means that the odds increase by 91% from the starting baseline of the odds of getting melanoma. Occupational exposure creates a higher likelihood of squamous cell carcinoma than other types of exposures. Occupational exposure also creates a higher risk for squamous cell carcinoma compared to basal cell carcinoma and melanoma. There is a 164% increase in the odds of getting squamous cell carcinoma from occupational exposure. Interestingly, occupational exposure has the weakest relationship to melanoma, with an 86% increase in odds. Melanoma occurs in melanocytes and people that have been working outside most likely have more melanin because of cumulative exposure and this protects from mutations to occur in the melanocytes, which would lead to melanoma. Squamous cell carcinoma occurs in the epidermis and is caused by cumulative exposure overtime, so it makes sense for this to have the strongest relationship with occupational exposure. If p53 functions correctly, can the dimer mutations still be overlooked? How are the dimers replicated? How does DNA polymerase read and interpret a dimer? How is exposure early on in life connected with a higher risk for skin cancer? Why is 10 years the magic number in this study? Is geographic location factored in for the occupational exposure table? Working outside in Mexico vs. working outside in Canada? 1. Armstrong, Bruce and Anne Kricker. 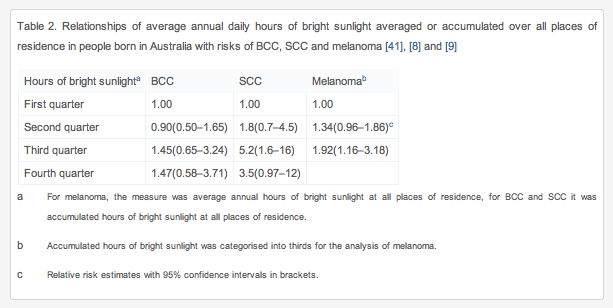 "The epidemiology of UV induced skin cancer." Journal of Photochemistry and Photobiology, 13 August 2001. Web. 28 May 2012. 2. "How Does Ultraviolet Light Kill Cells?" Scientific American, 17 Aug. 1998. Web. 25 May 2012. <http://www.scientificamerican.com/article.cfm?id=how-does-ultraviolet-ligh>. 3. Stanojevic, Milenko, Zorica Stanojevic, Dragan Jovanovic, and Milena Stojiljkovic. "Ultraviolet Radiation and Melanogenesis." Arch Oncol, 1 Dec. 2004. Web. 25 May 2012. <http://www.doiserbia.nb.rs/img/doi/0354-7310/2004/0354-73100404203S.pdf>. Check out the Cancer Biology Wiki. Can an Anxious Heart lead to Cancer (revised). Curry Spice Can Kill Cancer Cells? We've got to chill out - hakuna mata! Can Jaws Help Save Cancer Patients? (c) IslasLab.org—All aights reserved... Simple theme. Powered by Blogger.